SURFING is cool - everyone knows it. Until now though, I've just basked in its reflected glory - happy to pull on the cool surf clothes but not keen on the chilly, getting in the water bit. Having the chance to try in the warm waters off Portugal's Atlantic coast seemed the perfect opportunity. The pretty fishing village of Ericeira is just 40 minutes from Lisbon and is regarded as one of the best locations in Europe for surfing. There are nine beaches catering for all levels of surfer. I stayed in the stunning Ecolodges, a ten-minute walk from the town centre and a great place for a surfing holiday. This is the sort of place a real surf dude would stay - funky and modern self-catering wooden lodges for up to five people. Set in beautiful gardens with hammocks for post-surf naps, there is space to barbecue and an eco-friendly pool cleaned by plants, not chemicals. Alex, the 6ft 3in Austrian surf instructor, had two days to transform me from pasty Englishman to bronzed surfer. Style is everything in this game - the board, the wetsuit, the long wet hair. I had all that. But being a "new" surfer, I had to wear a fluorescent orange bib - my L plates. We made our way into the water for the first time and I very quickly learned one of the most important rules of surfing: Protect your head. Lesson two was to keep out of the way of locals. They can be very protective of their waves and as an outsider wearing a bright orange bib, you are bottom of the surfer chain. Third and most important lesson, stay away from the rocks. Obviously! The surf was ideal for beginners at Foz do Lizandro, with a safe, flat sandy beach break. I had no problem paddling out. But sitting upright waiting for the ideal wave to ride back in took more balance than I imagined. A lot more! It took four "wipeouts" before I got anywhere near even attempting to stand up on the board. After several tries, I managed to connect with a wave. I was on it. OK, I was not actually standing up but I was riding the wave - I was SURFING! Dragging my exhausted body off the beach, I was ready to relax. And Ericeira is just the place. It has a traditional Portuguese flavour, with cobbled streets, brightly coloured houses and family-run restaurants surrounding the square. I loved every second of the whole experience - I am hooked. I will be back because I have to know what it is like to stand up on the board. And it would be wicked to do it in style - without the orange bib. GETTING/STAYING THERE: TAP fly direct from Heathrow to Lisbon from £50 one way. See flytap.com/UK. Surfholidays.com have week-long self-catering trips staying in the Ecolodges, including six days of lessons, from £200 per person. They also offer trips to Spain, France and Ireland. 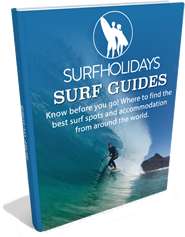 See surfholidays.com.